Description: A big EMD leads a older sibling on a manifest through Hanford. 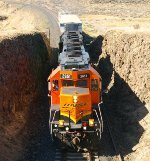 BNSF 2651 is a GP39-3 rebuilt from a former Santa Fe GP35u. Description: BNSF ballast train W-INBINB2-20A cruises through Seattle on the BNSF Seattle Subdivision between Lander Street and Spokane Street - BNSF 2651, 5 ballast hoppers, and BNSF 2888. Description: The afternoon Annie local crosses the Swinomish Channel swing bridge. Description: The Annie local heads west across a tidal inlet of Padilla Bay. Description: An abundantly powered Annie local passes the former location of Whitmarsh Junction. BNSF 2651 was originally ATSF GP35 1385. Description: The Annie local heads west. BNSF 2651 was originally ATSF GP35 1385. Description: The Thornwood local works Burlington yard. BNSF 2651 was originally ATSF GP35 1385. Description: BNSF train 644, the Sumas turn, southbound on the Bellingham sub just south of Stanwood. BNSF 2651 was originally ATSF GP35 1385. Description: Moving some cars around. Description: BNSF 2651 on work detail along the service siding in Vancouver. Description: BNSF 2651 possibly unmoved from the previous shot - but taken from the next bridge down looking at her nose instead of behind. Description: BNSF 2651 sliding along in second place with shift-n-sort duty at the top end of the wye.